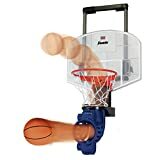 Become a free throw pro with Franklin’s Shoot Again Basketball Set. Whether it’s a bedroom or office, this mini hoop instantly turns any room into a basketball court. 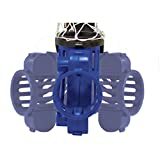 The height adjusts to accommodate different players while the ball return manually rotates 180 degree so that you can take shots from all angles and court positions, creating an authentic game experience. Play with a friend or practice your shooting while the electronic scoring and time clock tracks your game. Fun for ages 7 plus. ELECTRONIC scoring and time clock. Authentic announcer sounds! 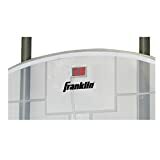 Interested in the Franklin Sports Over The Door Mini Basketball Hoop With Rebounder and Automatic Ball Return? Is the price too high? You can easily price watch this product and we'll notify you when the price reaches your target.